The Canadian Royal Mint introduced an iconic series of coins when they created the Canadian Maple Leaf. Maple Leafs have been struck from many different precious metals, including gold and silver. Canadian Palladium Maple Leaf coins, however, haven’t had as long or as large of a run as the coins made out of these more common precious metals. When the Palladium Maple Leaf was first minted by the Canadian Royal Mint in 2005, they were the first legal-tender bullion coin that were struck on a regular schedule by a national mint. This 9995-fine palladium coin is only produced as a one-ounce coin with a fifty-dollar face value. The obverse side of the coin features the contemporary profile of Queen Elizabeth II while her name ELIZABETH II is engraved along the rim on top. Below her profile, the face value is spelled out as 50 DOLLARS, followed by the year of issue. The reverse of the coin displays the very recognizable Canadian Maple Leaf. On the bottom left, it says FINE PALLADIUM; one the bottom right, it reads 1 OZ PALLADIUM PUR. The purity of .9995 is shown on each side of the maple leaf. The country of issue, CANADA, is stamped around the top of the rim. The Canadian Palladium Maple Leaf is made of 99.95% pure palladium. The Canadian government determines the face value for these coins, and Palladium Maple Leaf coins are considered legal tender in Canada. However, the face value of these palladium coins doesn’t necessarily reflect their precious metal value. The actual price of these bullion coins depends mostly upon the palladium spot price. 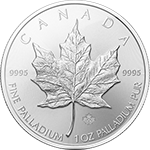 Hence, the value of one ounce of .9995 fine palladium will likely be higher than the Palladium Maple Leaf’s face value of $50. While investors may have more exposure to silver, gold or even platinum pieces, palladium coins serve as much as a store of value as these other precious metals. In fact, palladium is an even scarcer metal. Moreover, several industries require palladium, such as electronics, car manufacturing, and dentistry. Though less common than gold, silver, or platinum, jewelers may also use palladium. Palladium may actually further increase in value should there be growing industrial demand. Canadian Palladium Maple Leaf coins can be included in a precious metals IRAs. They fit the standard of purity, and the Canadian government backs the purity guarantee. Buying these coins can help investors diversify their portfolio and protect themselves against economic instability.